Transcript: Vision 2025 - What’s going to change for business owners? [TITLE] Vision 2025 - What’s going to change for business owners? 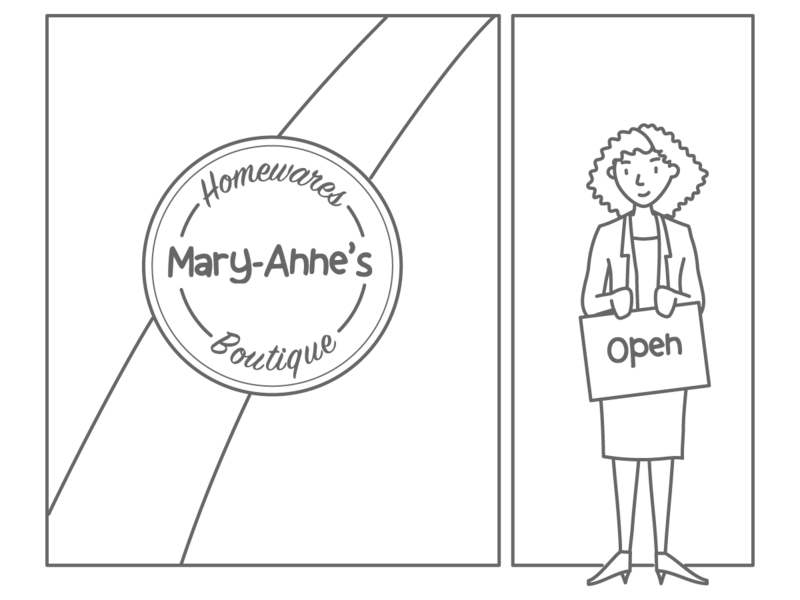 On screen: Illustration of Mary-Anne in front of a shop called Mary-Anne’s Homewares Boutique. Mary-Anne holds a sign that says, open. On screen: Illustrations federal government, state government and local government appear. On screen: Illustration of a tablet scrolling through several government homepages. Narrator: but finds the advice confusing. On screen: A question mark appears on the tablet. Narrator: She then speaks with the bank, friends and family. On screen: Illustrations of a bank worker, a friend with a baby and an older family member appear. Narrator: To save her time and worry, she goes to an accountant to help her understand what her options are. On screen: Illustration of Mary-Anne looking questioning and stroking her chin. Narrator: Her accountant helps her understand the regulations. On screen: An account holds a piece of paper and a calculator. A checklist appears with ticks and crosses being marked off. Narrator: The accountant applies for a government incentive. The application process in lengthy and she sometimes misses updates. On screen: The piece of paper in the accountant’s hand gets longer, until it reaches the floor. On screen: Mary-Anne is climbing on the illustrations of federal, state and local government buildings. Narrator: and doesn’t understand why she needs to keep providing the same information. On screen: Illustration of Mary-Anne looking cross, confusing and shrugging. On screen: Illustration of a chart of growth of time. An arrow progresses across the screen from left to right. It initially goes up, then drops then goes up again. Narrator: and Mary-Anne doesn’t know if she will meet her goals. Narrator: government information will be joined up, making it easier for Mary-Anne. On screen: A tablet appears, with a government illustration that combines the buildings of local, state and federal governments. On screen: Illustration of Mary-Anne looking happy. Narrator: helping Mary-Anne develop her business. On screen: A though bubble appears above Mary-Anne’s head that is filled with people from all walks of life. On screen: A tablet appears with a checklist of regulations. The items are numbered and ticked off. On screen: Illustration of Mary-Anne looking at her phone, looking happy. Narrator: to let her know she is eligible for incentives. On screen: Next to Mary-Anne’s image, a text message appears that says: Government notification: You are now eligible for a business incentive. On screen: A tablet appears. Narrator: with her government notifications all in one place. Her accountant can also access and update her information easily and securely, as her authorised representative. On screen: Mary-Anne’s accountant sits at a desk and is working from a laptop. Narrator: She can also nominate a staff member as an authorised representative on her account. On screen: Illustration of a staff member appears. On screen: In front of Mary-Anne’s shop, staff members appear. They have badges saying that they work in the shop. Mary-Anne is holding a sign saying open. Narrator: and is now running it successfully and with confidence. The business is time-consuming and she cannot afford to spend time on things that do not deliver immediate value to her business. She prefers to engage with third parties to find out what she needs to do, to save her time and worry. Her goal is to expand her existing business. She wants to open another store and scale her offering to keep up with growing and changing customer demand. She is unsure how the regulations and processes differ from state to state. She wants to make sure she can make informed decisions on the future of her business. Mary-Anne is unsure of the local and state regulations and processes that may impact her business if she expands. She speaks to banks, friends and various experts to understand the opportunities for growth. She later finds out that her state government offers free advice for businesses. She needs to understand the government regulations she has to meet. She visits multiple websites but the advice is confusing. She decides to get an accountant to help her translate the information. Her accountant lets her know she is eligible for a government incentive. However, the application process is lengthy. Her accountant sometimes misses updates as he needs to log-in to check for notifications. She needs to hire more staff but she worries about the regulations and processes involved. She consults a lawyer to make sure she is doing the right thing. She struggles to stay on top of dealing with multiple government agencies and the need to keep providing the same information. Local, state and federal information are joined up, making it easier for Mary-Anne to expand her business across the country. Mary-Anne has a single online view of all the relevant information she needs. The information is clear, simple and relevant to her. This means she can spend more time on understanding advice to develop the vision for her business. She is now aware of government regulations that apply to her and is confident she knows how to meet them. She receives a message from government that she is eligible for an incentive. She receives a notification that this will be paid into her account and when she needs to provide information. These government notifications are in the one place. Mary-Anne’s accountant is able to access and update information easily and securely on her behalf. Mary-Anne has visibility of this and is able to tailor what her accountant can access. This also means she gets consistent messaging from her accountant and government. As her business grows, Mary-Anne is able to nominate a staff member to handle the account. Navigation links for What’s going to change for business owners?